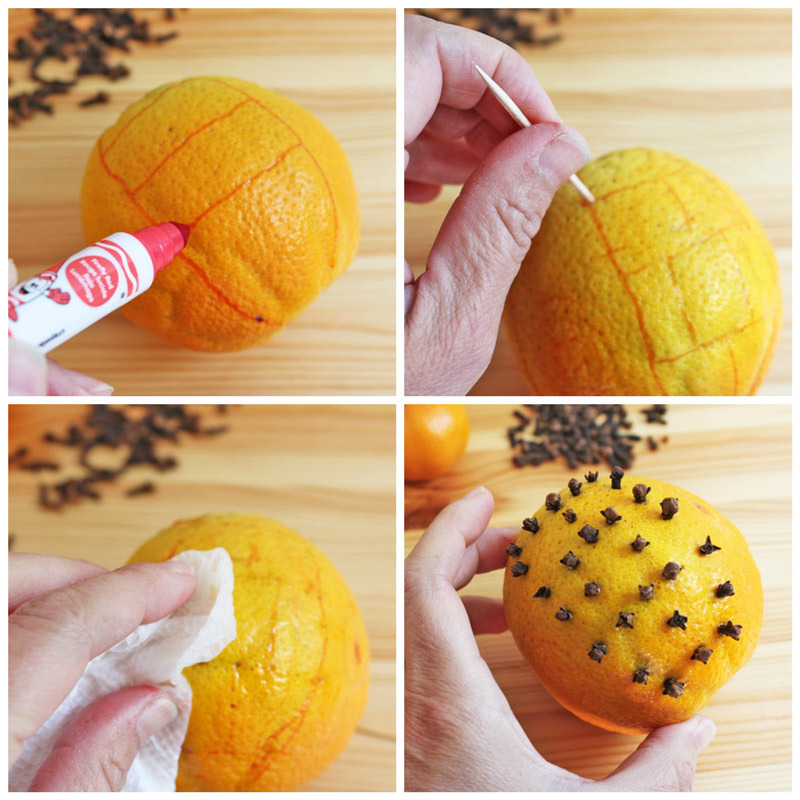 If you are looking for a sweet smelling fall craft for kids you just found it: Making Citrus Pomanders. Not only is making a pomander relatively easy, it’s a great way to combine an exercise in fine motor skills with a discussion of staying healthy. And this little puppy is supposed to last for years…yes, years, although we just made our yesterday so I have yet to test out that theory! 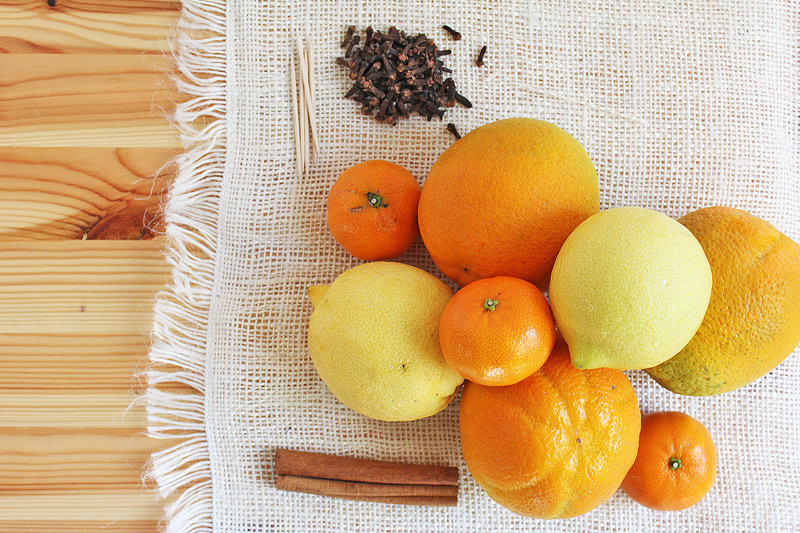 So grab some citrus, cloves, and kids and let’s learn how to make a pomander! 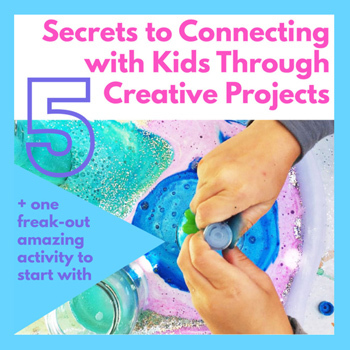 I originally saw this project in a great book I’ve been using as inpsiration this month: Nature Crafts for Kids: 50 Fantastic Things to Make with Mother Nature’s Help . 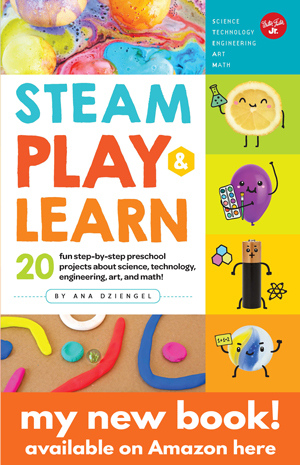 It was originally published in 1997 and has a host of great old fashioned projects using natural objects. But before we get started, just what is a pomander? Pomanders are typically shaped like a ball and are scented, in the middle ages they were used to ward off infections; in modern times they are used to freshen the air! And for a Halloween twist to this little object, they were thought to be a useful recovery charm in….wait for it….witchcraft (thank you Wikipedia)! Typically they are made with citrus fruits and cloves and can be placed in a closet or around your home for a wonderful fall scent! Ours are pretty fresh so the scent is light at this point….I’m curious what time will do for it. Follow up note: Use Oranges! 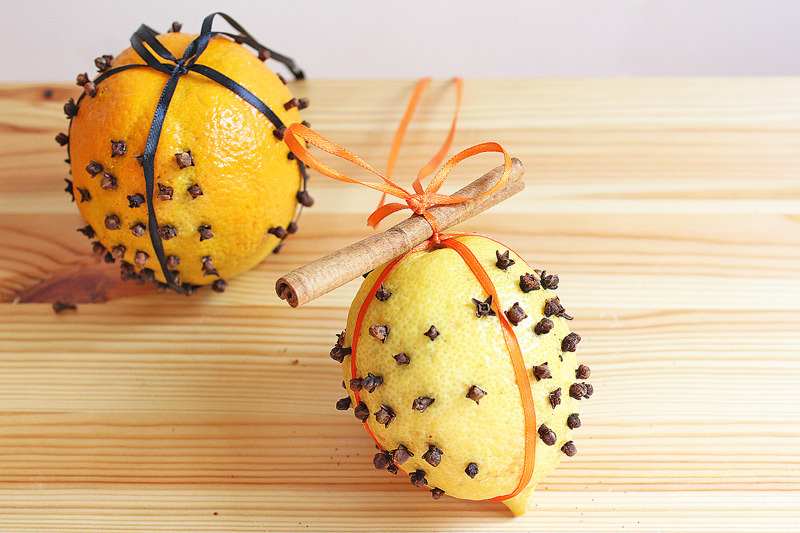 Our orange pomanders are still going strong but unfortunately I can’t say the same about our lemon pomander. I had to chuck it. I think it has something to do with the thickness of the skin. Our lemon skin started discoloring around the cloves within a week. Also store these in a cool dark place! TRUST ME on this one. I had one hanging in the window and let’s just say one morning I found some fruit flies to be enjoying it as much as I was….. Step One Think about the design you want for your pomander. Lightly sketch it out on the surface of the fruit using washable makers. Keep it simple! Step Two Using a toothpick poke holes along the design you sketched. The holes should be about ¼” apart but you can eyeball it. Step Three Wipe off your fruit to wash away the marker lines. Step Four Place one clove in each of the holes. Poke the long end of the clove into the holes. Step Five Cut a length of ribbon. Tie the ribbon around the fruit as you would wrap a present. Add a cinnamon stick at the top if you like. Step Six Find a place to hang your pomander using your ribbon. Citrus with thick flesh is best. Tangerines have a pretty thin skin but may be easier for kids to puncture. Once you start puncturing the skin of the fruit, juice will start seeping out of the holes and will start washing away your pen marks. I recommend just sketching one section at a time with your pen AND not getting too fancy. The simpler the better! Kids may find poking holes first too tedious so go ahead and let them use the pointy end of the clove to make the hole as they push it into the fruit. Hang these in a confined spaces like a bathroom or closet so you can get a pungent little punch each time you pop open the door! Once they are a bit dry, you can place them in a cloth bag in a drawer to keep clothes smelling fresh. Drying takes several weeks. Science: Since we always focus on the inspiration behind the object we are making I couldn’t help but think of the field of medicine. After all pomanders were thought to prevent infection in days past. Even though most kids will understand that pomanders offer no medical benefit, this is a great opportunity for you to discuss staying healthy with your kids. There are so many ways kids can work on disease and illness prevention like eating healthy foods, washing their hands, and getting plenty of rest. And flu season is just around the corner…. 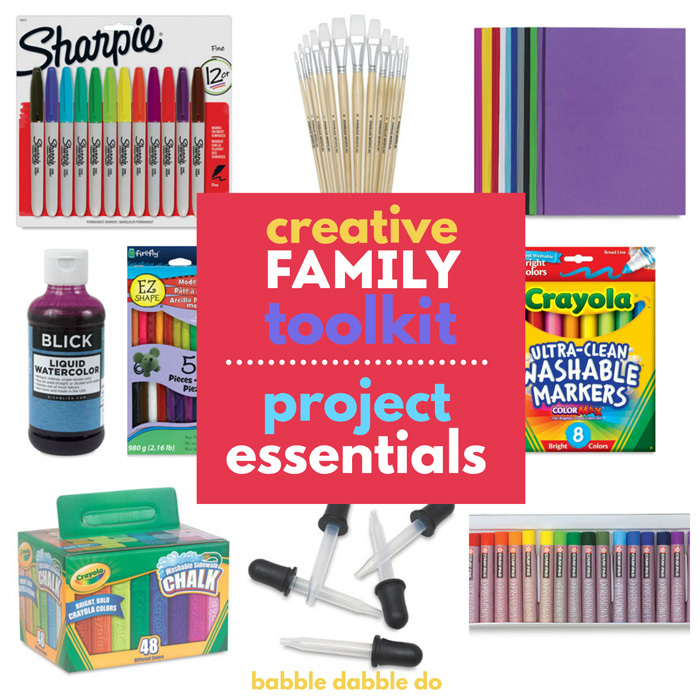 Art: A second way to engage your children with this project is to talk about pointillism. That is the art technique of making pictures out if dots of color. Making a design out of cloves is a basic form of pointillism. It’s also a personal favorite of mine from the Impressionist era. And a modern day artist who also uses pointillism is Chuck Close. His paintings and simply amazing. Up close they are tiny dots but take a step back and be prepared to be shocked at what little bits of color look like from a distance. If you ever have the opportunity to see his work in person, jump on it! 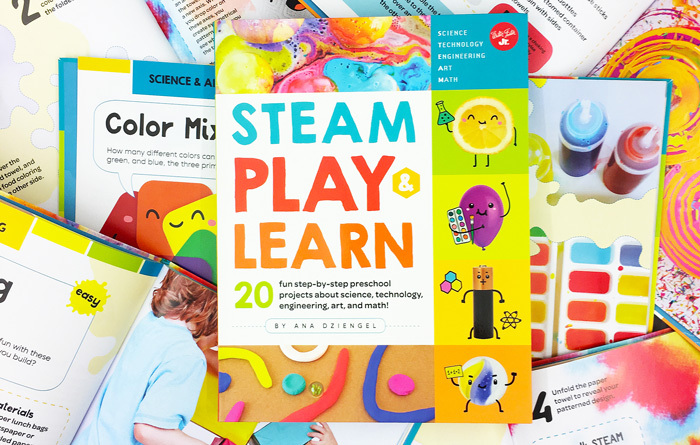 If your kids like working with scented projects I have a super fun one for you: the Smelly Game. Cloves and citrus scents could easily be incorporated into it And if you just plain like making things fancy be sure to pop over to this post: Rainbow Tree. So if you need a scented little fall craft for kids using things you probably already have on hand you must make these pomanders! They would also make a nice fall gift for Thanksgiving….yes it’s just around the corner! Don’t miss out on our upcoming projects featuring natural materials all month long! Be sure to subscribe or like us on FB to follow along! Your child’s inner Chuck Close thanks you! Fall is my favorite time of year and I’m always looking for new things to do for the season. Thank you so much for this kid friendly project. Not only will my son and I have a blast making these for our home, it will make our home smell so good. I noted your suggestion of using oranges only:) So, did the smell last a while? Thank you for your great ideas! I can’t wait to come back and read more.